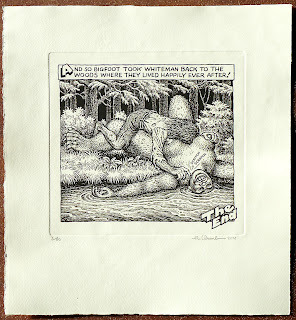 The reimagined last panel of Crumb comic "Whiteman Meets Bigfoot"
The official newsletter for RCrumb.com has announced a new etching by one of the best illustrators in modern american history. If you have netflix we recommend seeing the documentary titled simply Crumb. 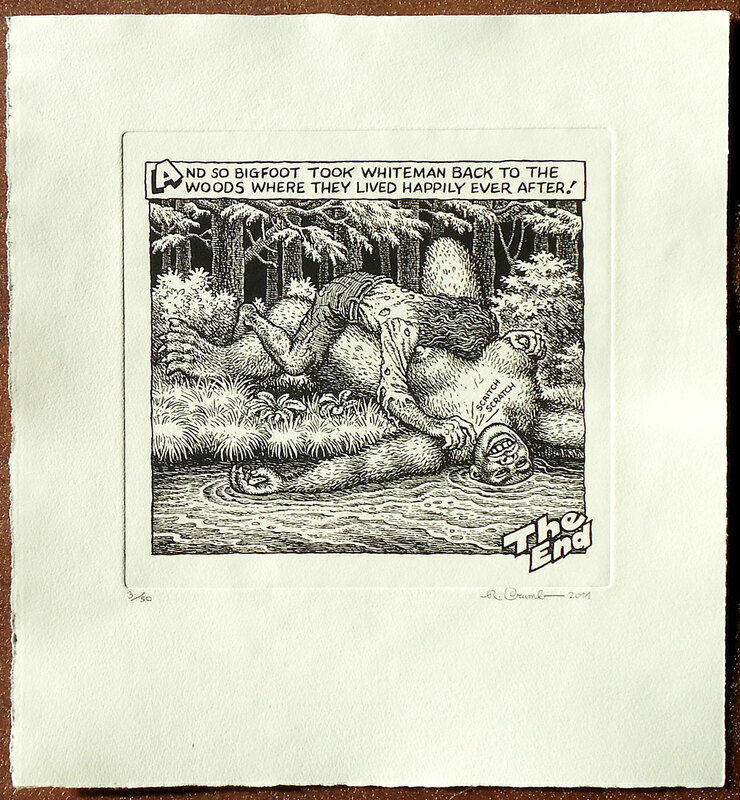 Below you can read the story beyond this new etching that is based on the last panel, of the comic "Whiteman Meets Bigfoot"
Wildwood Serigraphs and The Official R.Crumb Site are proud to announce the release of a new Crumb etching. The image is from one of Robert's best-known stories "Whiteman Meets Bigfoot." It's the last panel, in fact, and as close as Crumb ever gets to "happily ever after". This story first appeared in Kitchen Sink's Home Grown Funnies, which was their best-selling comic book of all time, with sales of over 160,000 copies. The reason for its popularity was simple: almost the entire book consisted of the legendary "Bigfoot" story; the longest Crumb had produced up until that time. It was upbeat, funny and even romantic -- not the standard Crumb fare. Publisher Alex Wood explains,"I proposed the idea to use the last panel as an etching to Crumb some years ago. Robert thought the drawing was too crude, and didn't want it released in its original form; he would have to rework it for the etching. He ended up starting over from scratch, completely redrawing the image for this edition." There are 50 etchings in the edition. The image size is 8" wide by 7" tall. The embossed area is about 9" wide and 8.5" tall. The white archival Hahemuhle paper is 14" wide by 13" tall. Each etching is signed, dated and numbered by Crumb. This is the cleanest, best etching edition we have ever printed, and we give you our unconditional guarantee for your complete satisfaction or your money back. I read that comic in ZAP comics back in the 1990's. It is very funny.